How to Write the College Application Essay: You already know how to write an academic essay. You start with an introduction, throw in a thesis statement, find about three paragraphs' worth of evidence, and wrap it all up with a tidy conclusion. Writing the college application essay is different. What should I write my application essay about? Students who are willing to share who they are as a person, distinct from their academic record and test scores, are the students who stand out. College Essay Brainstorming Techniques: Need help starting that dreaded college essay? Here are some tips to get you started! Kick Start Your College Essay: A few tidbits to help you brainstorm your college essay! What are some of the cornerstones of a good college application essay? 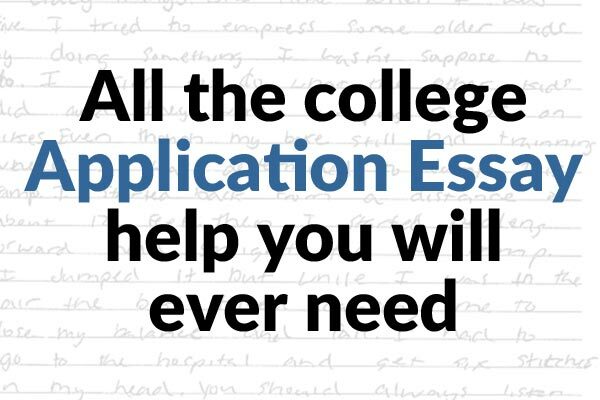 A good college essay can help you get accepted, but a bad one can sometimes prevent it. That's why it's important to do it well. The Best Way to Generate College Essay Ideas: How can you come up with the basis for a standout college application essay when you have no idea where to start? Try free writing. And start with these tips. Application Essay Example 1: The Beard: The essay a student submitted with his application to Denison University in Granville, Ohio, and it helped him gain admission there. Check out the essay, then make sure you read our tips! Application Essay Example 2: The Importance of Playing Dress Up: The essay a student submitted with her application to St. Lawrence University in Canton, New York, and it helped her gain admission there. Check out the essay, then make sure you read our tips! Application Essay Example 3: The Surgeon: The essay a student submitted with his application to Loyola University New Orleans. He is a graduate of The American School in Switzerland. Check out the essay, then make sure you read our tips! Application Essay Example 4: Small Town: The essay a student submitted with her application to The University of Tampa in Florida, and it helped her gain admission there. Check out the essay, then make sure you read our tips! Application Essay Example 5: Why They Call it Fishing: The actual essay a student submitted with his application to Willamette University in Oregon, and it helped him gain admission there. Check out the essay, then make sure you read our tips! Admission Essay Example 6: Ball of Yarn: The essay a student submitted with her application to Lincoln Christian University in Lincoln, Illinois, and it helped her gain admission there. Check out the essay, then make sure you read our tips! Mastering the Application Essay: There is only one part of the college application left to submit: the dreaded essay. Admission Officers' Secrets to Standing Out in Your College Essay: These five college essay tips—straight from admission professionals—will help you and your college application stand out. Insider Essay Advice: Where does your application essay stack up against the thousands that are submitted every year? Why Your College Application Essay Matters: Worried about writing the "perfect" college application essay? Guess what: admission officers don't want perfect! One admission insider explains. The Transfer Essay: Introduce Yourself to Your Dream School: Before sitting down to write your transfer college application essay, use this one simple question as a guideline to your future: why are you applying to this particular college? Top Tips for Writing Your College Application Essay: While a tough part of the college application, essays are also your big opportunity to highlight your strengths and discuss material not presented anywhere else. Here, Tutor.com's writing tutors share some of their top tips here. How to Write the "Why Us?" Essay: When it comes to the "why this university?" application essays, lots of students misunderstand the prompts—and miss out on an important opportunity to stand out. Top 10 Application Essay Do's and Don'ts: Our top 10 admission essay/personal statement do's and don'ts! Three Common Essay Mistakes: The essay you submit when you apply to college plays a big role in the admission process; it is the one area that allows you to creatively express yourself. So what do you need to watch out for? 5 Ways to Kill Your College Application Essay: Here are five omissions or errors that can lead your application essay—and your chance for admission—astray. Warning! These College Application Essay Ideas DON'T Work: These are college application essay #FAILs waiting to happen. Who can help me write my application essay? Writing is not a group activity, and you should always write your college application essay on your own. You can get guidance, but make sure it is the right kind of help. The College Essay: A Lot Like a First Date: Bet you didn't know a college essay is a lot like a first date: You've got to put yourself out there and make a good impression. Answer One Question to Stand Out in Your Common App Essay: Before you start writing the Common App essay (or any other personal statement), ask yourself: What do I want colleges to know about me that is not apparent from the rest of my application? Learn from My College Application Mistakes: The Application Essay/Personal Statement: Your college application essay or personal statement is one of the best ways to set yourself apart in the admission process. Here, someone who's been there shares the mistakes she made on hers—so you can avoid them. Not Your Typical Admission Essay: Multimedia essays are a new trend in the college admission process. Why Your English Paper Doesn't Make a Strong College Essay: Year after year, students send us college application essays to review that were written for an English class. Most of the essays earned A's . . . but not a single one was ready to submit with a college application.